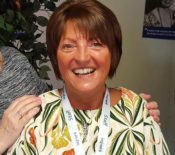 Hi, I’m Bev and I have actively been involved with Women’s Community matters since August 2015. I supported vulnerable women who were accessing the centre that had been referred to me by my previous employer for floating support. This could have been for many things including mental health and wellbeing, women who had suffered any sort of historic abuse, substance/alcohol misuse and housing problems. When the funding ended within my last employment I could not leave the centre as loved everything Women’s Community did and stood for. I started volunteering in January 2016 and was very lucky to be offered the post of Volunteer Co-ordinator which I applied for in June 2016. My post involves interviewing, training and supervising volunteers. Currently I work as a project worker on New Lives project, I work closely with other members of staff and other organisations and I am also based at the Egerton Hub on a Tuesday afternoon.